IIHMR Bangalore was previously known as "Indian Institute of Health Management Research" (IIHMR), Bangalore. With increasing emphasis on quality of health care and patient satisfaction, there is a tremendous demand for candidates with a professional qualification in hospital management. Since 1984, the Indian Institute of Health Management Research (IIHMR) has responded this call successfully. The mission of improving the standard of health through better management of healthcare and related problems accorded IIHMR the thrust to reach a peak where the optimum healthcare management professionals will be implanted with appropriate skills and competencies required for performing their job effectively. "We believe that our expertise is in healthcare management and so should primarily focus on health systems research and management," says Dr. Usha Manjunath, Director, IIHMR, Bangalore. The institute offers a full-time two-year course in PGDHM (Post Graduate Diploma in Hospital & Health Management) and understanding the IT revolution, IIHMR has included specialization in Health IT management for the students. Any graduate who aspires to serve in the healthcare sector can pursue this course. IIHMR acknowledging this emerging element has signed MoU with Maastricht University, Netherlands and have close associations with 30+ hospitals and other healthcare organizations formally and informally for various collaborative activities. Being an AICTE affiliated autonomous institution; IIHMR Bangalore enjoys the liberty to upgrade the curriculum as and when demanded by the industry. The institute has an Academic Advisory Council, including practitioners and experts from the healthcare field to assist updates regarding the curriculum. Within the two-year course period, the students are motivated to attend classes by industry experts, faculty members along with undergoing two months summer training, three months of dissertation, internship and frequent field visits. As the name of the institution suggests, research is a major part of IIHMR where the teachers and the students are encouraged simultaneously to accomplish research works on unexplored topics. The institute undertakes numerous research projects for International NGO's, State Governments, Central Governments and Corporate for their CSR activities relevant to the healthcare sector and indulges the students actively to take part in these projects and gain insights about the same. Over the years, the institute has completed research projects which have been proved beneficial for the community. "We shall continue taking up more research activities as it will create new exploration and introduction of concepts on which not much work has been done. Presently, we are working on research projects for UNICEF, Alive & Thrive, ICMR (Indian Council for Medical Research), DCW (Deaf Children Worldwide) and so on," shares Dr. Usha. The Institute also involves students in the research activities; which is an added advantage for students who want to shape up their career in Public Health domain. IIHMR is also the 1st educational Institute in the country, which has been accredited by NABET, QCI to perform NABH consulting for Hospitals and Healthcare organizations. Industrial involvement with an institution today, is as important as the quality of education, as students are substantially inclined towards receiving practical training in spite of theoretical classroom learning. IIHMR acknowledging this emerging element has signed MoU with Maastricht University, Netherlands and have close associations with 30+ hospitals and other healthcare organizations formally and informally for various collaborative activities. IIHMR also conducts an international conference yearly, "Adwitya" which lasts for two days where C-level speakers visit the campus and share meaningful views with the students. It acts as a forum for knowledge sharing among various stakeholders of healthcare. Considering various phenomenal steps and procedures, the institution has initiated to inculcate a stable base to one's career, the recruiters who visit the campus for placement hires the students without any second thought. "Over 50 percent the students who are currently in the 2nd year have already received their offer letters and we are convinced that the rest of the students will be handed over their offer letters by the end of this November," opines Dr. Usha. Sensing the amount of efforts a student and the parents put while undergoing a programme in a prestigious institution, IIHMR take it as their duty to cater employability to each student and make their journey in the campus fruitful. As the medical fraternity around the country considers Bangalore to be the upcoming medical hub of the nation, based in Bangalore, the students of IIHMR get access to consummate job opportunities from organizations like Allscripts, Dell International Life Sciences, Deloitte US India Pvt. Ltd., Sapphire IMS, Practo, Health Care At Home, Ramakrishna Hospitals, NH, Infinity Research, Vidal, Global Hospitals, UNICEF, Lifeline Healthcare, and ICT Health just to name a few. "We have touched almost every arena of healthcare management education and are on the verge to board into launching an incubate hub very shortly, which can be a long-term solution for entrepreneurial students along with building more industrial relations," concludes Dr. Usha. Handling the role of Director in IIHMR-Bangalore, Dr. Usha Manjunath is a Ph.D. holder in Quality Management from BITS, Pilani. She completed her M.Sc. (Speech & Hearing) from AIISH, Mysore and M.Phil in Hospital & Health Systems Management. She has 18 years of experience as a Management faculty and has also presented and published research articles in National and International Conferences. She has authored a book named "Total Quality in Healthcare-An Empirical Investigation" based on her doctoral research work, supported by ICSSR grant. 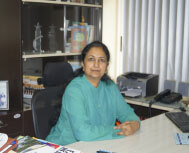 In the recent past Dr. Usha has taken up projects on maternal-child health, baseline/end line evaluation, IEC/BCC in public health, nutrition (life cycle) and public health with various agencies such as GoK, UNICEF, Alive & Thrive, Deaf Child Worldwide, ICMR, ICSSR, Food & Nutrition Board-GoI, Association of Persons with Disabilities and other NGOs.